Pardon the dust, friends. We've been busy moving things around here. And by "we" I mean the fabulous Brittany from Gallery No. 8 and I. It's been almost two years since my last redesign and I've had this latest look stewing in my brain for a while. I came up with the design and Brittany magically made it happen. I have no idea how to code so I'm always in awe when people like Brittany do what they do. Looking for a new blog design of your own? Brittany's your girl. - The tabber widget (gray box on the top right) consolidates four functions into one neat little spot. Looking for something? Start your Search there. Click on the social media icons above to find me elsewhere. - Labels now appear under the post titles. Say you want to see all the Before and After posts, just click on the orange label. I've also listed them down the sidebar and you can see all old posts By Room or by Category. - The layout is a bit more organized now to display sponsor advertising. If you're interested in reaching my awesome readers, all the details are on my Advertising page. 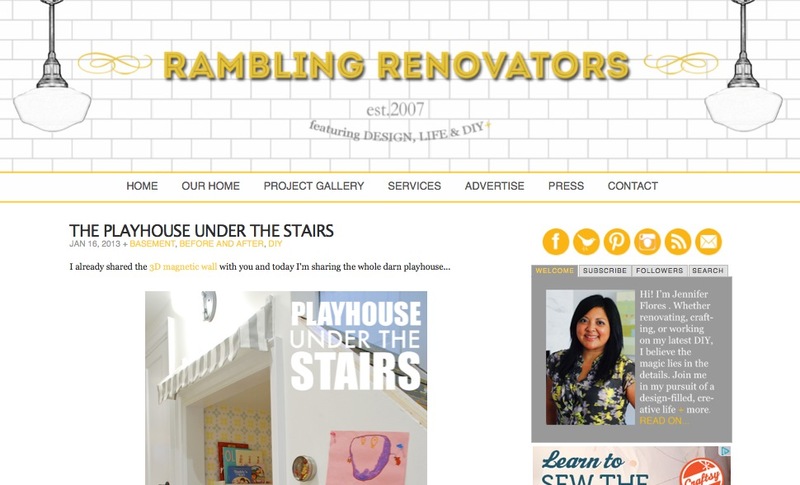 - And I finally got my own domain, www.ramblingrenovators.ca. Any links to the old blogspot address will automatically redirect to the new domain, but I would appreciate it if you could update your links if you have me in your blog roll or links. I think that's about it. Let me know if anything looks wonky on your end as we're still fixing a few little bugs. I was craving something fresher and brighter and a little more me circa 2013. Hope you like the site! Wow- Brittany did a great job with the redesign! I love the new header! The tabber widget is definitely a great addition! Love the graphics, hate that the blogger update now forces the mobile version onto my iPad, which makes it look like crap. Looks amazing!!! I love the subway tiles in the header. Classic and stylish, just like you. This redesign is fabulous. You must be over the moon with all of the changes and how your blog has grown. Congratulations! I love the new header, it's so bright and cheery. I am working on a blog redesign right now and am doing all of the coding myself. Since I have no idea what the heck I am doing it is so. much. work. Thank you so much for including me in your blog roll on your sidebar! I saw it listed over there yesterday and let out a little squeal. It means a lot. You're welcome :) Good luck with the blog redesign! The new look is awesome! Love it! Oh my gosh, Jennifer! The new site is GORGEOUS! I am absolutely in love with your header and colours in particular. They just suit the site so well. I LOVE the new look...looks so great, and so fitting for you and your blog. Great job Brittany! Oh I love this new look, simple, elegant and a bit vintage. It's a perfect shade of yellow.